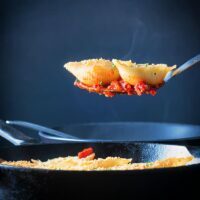 I love stuffed pasta shells and these glorious treats are stuffed with salami and goats cheese and baked in the oven in a cast iron skillet. Skillet Goats Cheese Stuffed Pasta Shells. 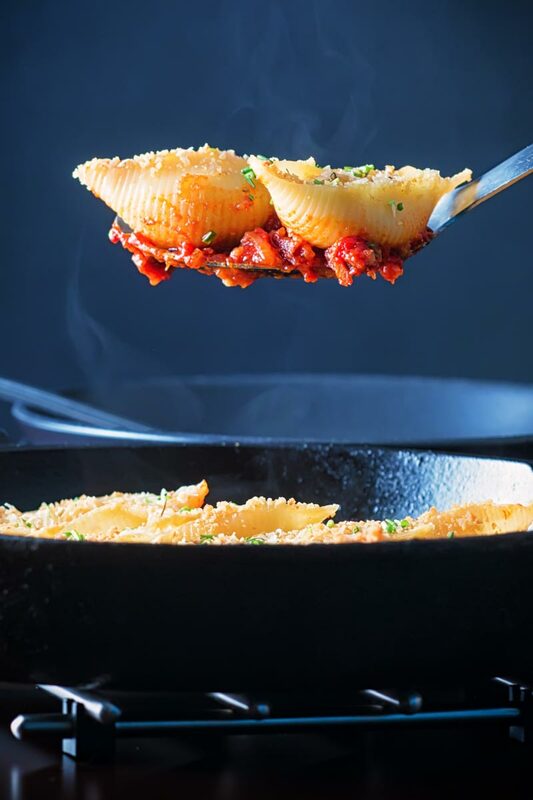 I love Stuffed Pasta Shells and this just happens to be my favourite way to stuff them. I would say that wouldn’t I, but seriously this is the only way I do it! Most of my pasta recipes are much closer to Italian classic pasta ideas. This one, however, is full on Italian American and all the better for it. 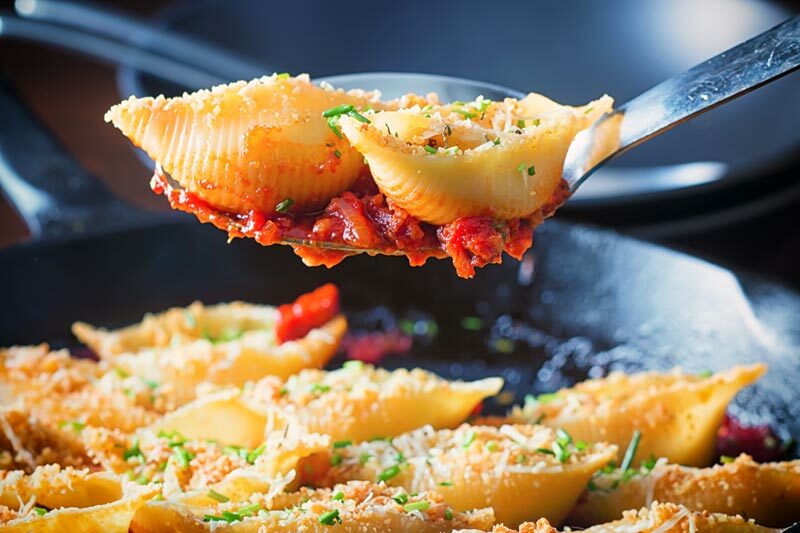 Regular readers will know I am much more interested in flavour than I am authenticity and these stuffed pasta shells really deliver on flavour. That acidic salty kick from the goats cheese is mellowed by the tomato sauce and matched perfectly by the slightly spicy salami. Salami is not just for pizza! My choice of salami for these stuffed pasta shells is uniquely Hungarian, a Mangalica Kolbasz. Kolbasz is just the word for this type of cured sausage and Mangalica refers to the breed of pig. Mangalica pigs as far as I am concerned are the kings of the pork world. Little known outside of Hungary the Mangalica pig is furry, yes furry! Check out this article for more on my favourite porker! Most importantly it is really quite fatty in comparison to many breeds of pig. You will often find marbling in the meat in much the same way you would with great quality beef. Goats Cheese, Love It or Hate It? Goats cheese certainly seems to be a bit of a Marmite type of food. Any claiming to love or hate it with very little in between. I am firmly in the love it brigade! Paired up with a spicy salami and turned into these stuffed pasta shells then baked in the oven over a simple tomato sauce and I am in comfort food heaven. Cooking it in the skillet also means very little washing up too, so a win all the way around. 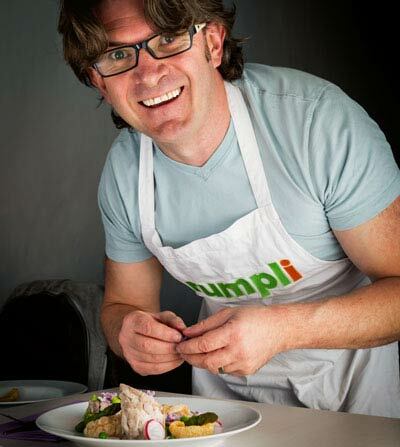 Goats Cheese is a regular guest star here on krumpli. Whether it is this rather fancy and indulgent fried goats cheese or the sublimely simple pesto spaghetti with goats cheese, I’m in. All in! You could use any type of cured dried sausage for this recipe and I have used salami more as a generic name here so no fixed ideas. I think spice works really well. But what you really are looking to take advantage of is the wonderful oils in the salami. Cooking it down in the skillet first gives you an incredible base for your sauce. If you are a regular here you will know I am a little bit fond of cooking in a cast iron skillet. I’ve had mine for nigh on 30 years and it has been a faithful companion in my cooking history. Whether it be my Skillet toad in the hole, kedgeree or even bubble and squeak they are recipes very close to my heart! The great thing about cooking in a cast iron skillet is the ease of clean up. Seriously they just wipe out, no scrubbing or elbow grease! My wife loves me cooking recipes like this stuffed pasta shell recipe and not just because it tastes fantastic. You see we have a rule and that is the cook never washes up, this recipe means very little washing up! Do you own a cast iron skillet? If so what are your favourite cast iron skillet recipes? I love new ideas from my readers! Cook the pasta shells in boiling salted water until cooked a little less (90 seconds or so) than you would to serve normally. Heat your skillet over a medium heat and add the salami to the dry pan and allow to cook so it release the oil for 5 minutes. After 5 minutes remove around half of the salami and set aside then add in the onion and garlic and cook in the oil for 3 minutes. Now add in the tomato puree and stir in before adding the passata, reducing the heat to low and cooking for 10 minutes, test for seasoning and add salt and pepper as required. Whilst the sauce is cooking preheat your oven to 180°C. Melt the butter in a frying pan and fry off the breadcrumbs until golden and the drain on some kitchen paper. Divide the cooked salami that you set aside into the bottom of the pasta shells and then stuff with the soft goats cheese. Sprinkle over the breadcrumbs and the the grated Parmesan cheese and arrange in a single layer over the tomato sauce and transfer to the oven and cook for 30 minutes. Sprinkle with chopped chives when ready to serve. We all know that cast iron gets hot so be careful when cooking with one of these bad boys. Would you be able to convert the grams and ml into ozs, please? Will be trying this very, very soon. Sorry, I really don’t think in imperial measurements and I find automatic converters for websites pretty poor as they go well beyond metric to imperial and mess with all sorts of parts of the recipe. Nicely done, looks delicious and mouthwatering. Goat cheese is my favorite cheese, and I can wait to try this amazing recipe. I want to say that the pictures you put in this post are incredibly delicious 🙂 Thank you for sharing this dish with us. So glad you like them, they are super fun and so simple. You had me at goat’s cheese. It’s one of my favorites and I can’t wait to try this for dinner this week! OMG I am SO making this this weekend! Goat cheese is my absolute favorite! You certainly know how to make an amazing pasta dish Brian. Looks delicious. Now I need to make this too. I still have canned passata from your recipe posted earlier this year I can use. Yay! I adore goat cheese, and his recipe looks delicious. Can’t wait to try it. But could you please tell me what tomato passata is? I live in Canada and have never come across this before. Is there an alternative if I can’t find it? 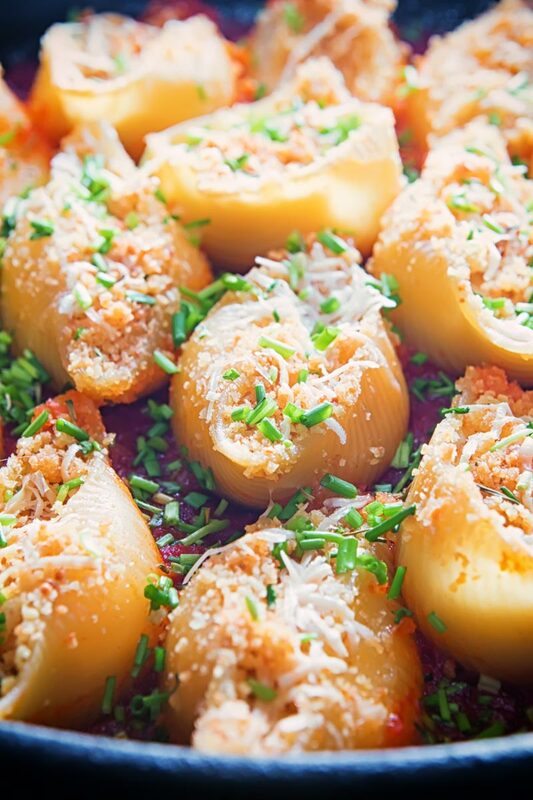 I’ve been craving stuffed shells and I love the filling idea! Thanks Denise it is really good. This looks so beautiful and just delicious. Love how you used goat cheese in this recipe 😉 Sharing this! 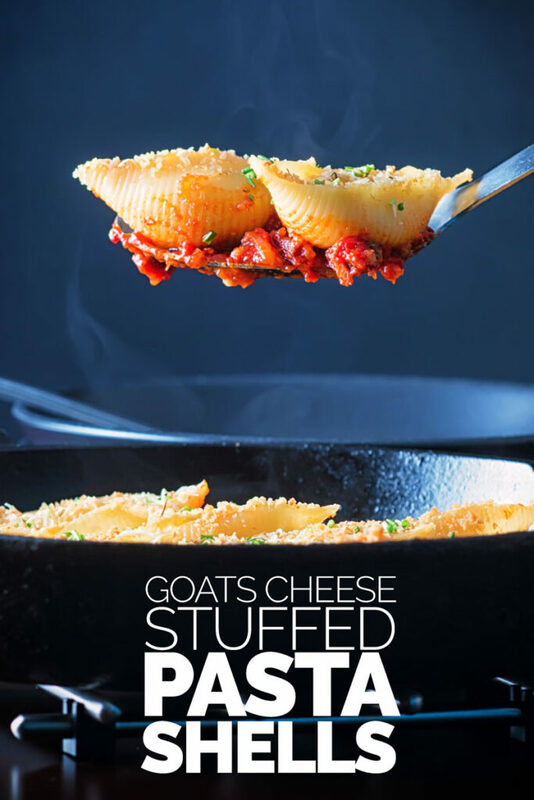 I have been craving stuffed shells lately, adding goat cheese sounds incredible. Can’t wait to try them! I hope you enjoy as much as we do. We are totally on the same page — first I’m a goat cheese lover too! Second, I just made a whole dish of stuffed shells! Great minds think alike! 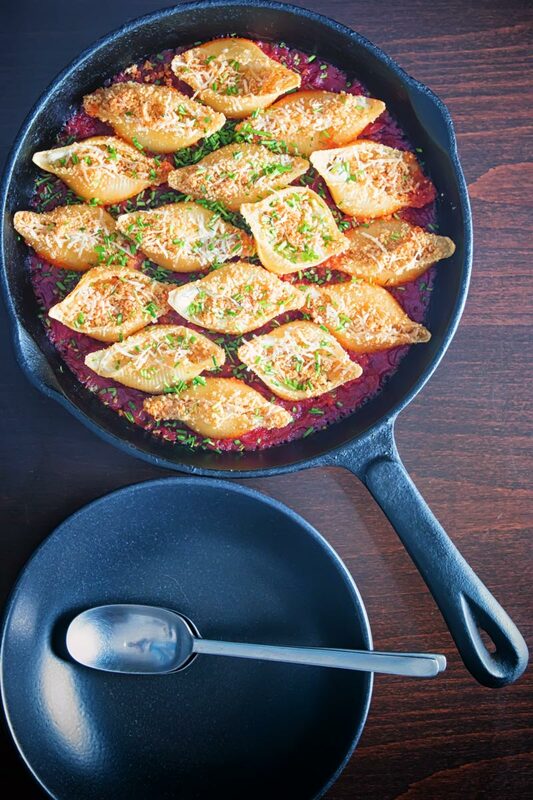 Basically…I’d love to swan dive right into this skillet and enjoy every single bite of these shells. Is that weird? I just love goat cheese and this combination of flavors sounds amazing! Wow! I love the addition of fried breadcrumbs before the sprinkled parmesan. That’s an extra comfort factor right there!